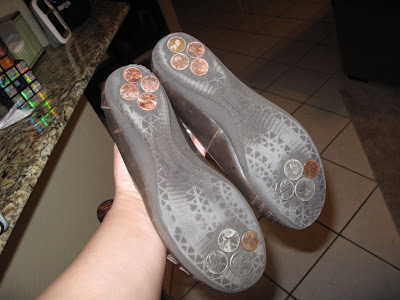 She had super glued coins to the bottom of a pair of shoes! And she then danced the night away. We were laughing and laughing as we each took a turn. Now I can say I've tap danced with shoes that have coins glued to them. Awesome. We are the coolest and I know you wish you were us right now :)And I tried taking video(because Tara seriously has some tap dancing skillz) but I guess I didn't do it right because there is no video on the camera. DANGIT. It would've been worth your time. She rocked those puppies. LOVE it! You started my day with a smile (OK, a big smile, maybe even a laugh!) -- this is fun stuff! !